Hey everyone. I’m going back to the UK for some moody electronic music. I’m not going to say much in order to sound depressing. Only just that I love dark wet lukewarm winters. 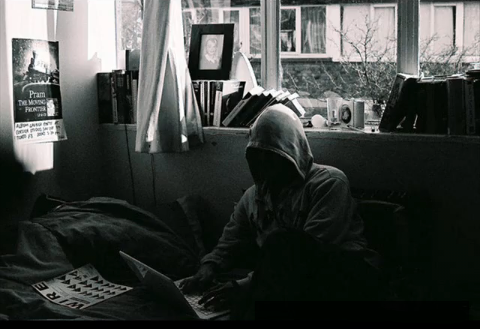 Burial released his award winning album Untrue in 2007 – his second full length album. He himself actually remained anonymous until 2008. He revealed his identity in order to accept his award and stated that he just wants to remain a low key music producer. People say that he redefined dubstep. His music has elements of 2-step, ambient, and house. If you think you are about to hear dirty wobbles then please leave. Or stay. This is much better than any wobbles could ever be. “Archangel” begins with one of the coolest beats out there. You try to wrap your mind around it, but you cannot comprehend what is going on. The vocal samples are cutup in such a manner that it sounds like you listening to a ghostly love-story. The way the pitches of the samples are altered create a mock-melody which when supported by the violin-synths creates a rather atmospheric experience. The music is technically dance, so yes it does drag out with a repetitive beat, but don’t let that distract you from the small changes going on. The general feeling is what counts. The burning crisp in the background, changes in frequency, as well as changes in the vocal samples all make for the effect as if the song was angry and therefore ending in a moody upset sort of way. “Ghost Hardware” is one of the dreamiest dubstep songs out there. An ambient synth and female vocal samples introduce the beat. The beat again is unmatchable and this time random noises are included. My favorites are the bullet casings falling to the ground and the sound of the tape being ejected. The different vocal samples are what really shine here. He picked the perfect samples to make those important builds and then relieves them with the suddenness or the “Love you” sample. A very circular experience. Wait for the random Brittish man to speak towards the end because it signifies a pretty nice stall. All I can picture is floating in a dark tide. Listen to this song while driving on a rainy night. Only then will you truly be able to appreciate this song as well as all of Burial’s music. Such complex music is far above any sort of simple wobbles and don’t be upset if you don’t understand it. You probably just don’t have the proper range of emotions. And if you choose to challenge that then maybe listen to the song below entitled “Ego”. It’s actually a collaboration between Burial, Thom Yorke, and Four Tet and slightly more on the house side. Regardless, this song is how I got my superior sense of emotions and moodiness. Fantastic stuff! One of the albums and artists that turned me onto the loads of brilliant left-field dance music coming out of the UK at the moment. Good picture: driving on a rainy night listening to this and perhaps with no streetlight too. Maybe a cup of hot beverage by my side. Yeahhh, that will be sweet!